"Measuring Time," a group show launched in conjunction with the Chelsea Music Festival, opened at New York University's Deutsches Haus on June 15. I'm very pleased to have seven prints in this show, three from my series de-composition and four from the Littoral series. It's the first time photos from Littoral have been shown and the most work of mine to be exhibited at one time in New York for a few years. 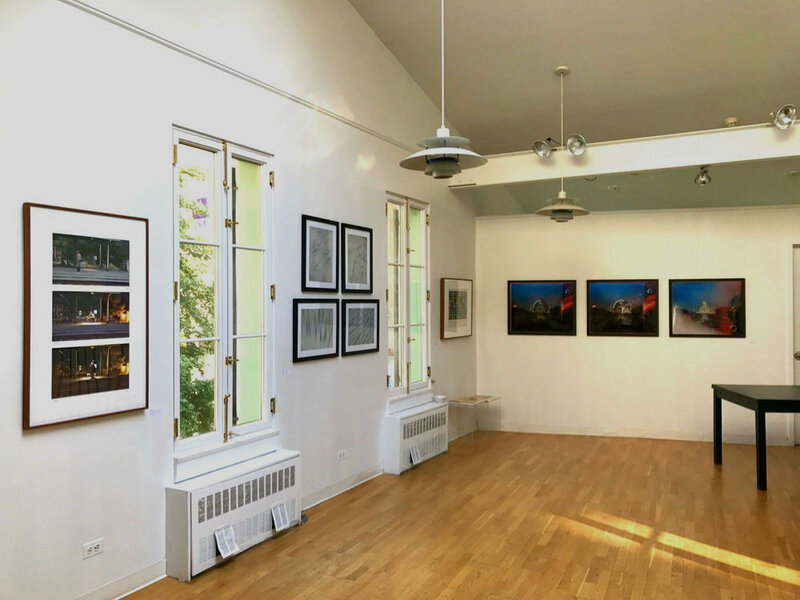 Part of "Measuring Time" at NYU's Deutsches Haus with Littoral photos in the middle (between the windows). My de-composition photos are on another wall. The show features the work of six artists (four from German-speaking countries), all of which relates to time, though not in obvious ways. It includes woodcuts, drawing, photography and stills from video. The curators chose my work for its focus on decay -- you could call it the effect of time on matter -- whether images of decaying flowers in de-composition or the shifting patterns of sand captured in Littoral. In one way or another, all my photography, with its exploration of mortality and loss, is a form of "measuring time." Deutsches Haus is open daily (except Sundays) and is located at 42 Washington Mews in Greenwich Village, which is just off University Place half a block south of 8th Street in Manhattan. The show is open until August 26. In a somewhat different direction for my work, I’m pleased to have a new piece called The Buried in “Personal is Political is Personal,” a show of political art curated by radical artist and printmaker Sue Coe at 440 Gallery in Brooklyn. The show opened July 7 and is on until August 6. Consisting of candles, flowers, an indistinct photo and other items, The Buried is a sidewalk memorial to forgotten and never known victims of police and other state violence. Those who aren’t on the long list of names we all can say now. It’s my first installation and the first time I’ve found visual expression for a long history of political engagement in my personal life. It’s an idea I had a year and a half ago and I’m grateful to 440 Gallery and Sue Coe to have the chance to realize it. I'm thinking of it as the first of a series. The installation is intentionally ad hoc and makeshift looking. Except for the photo, which is relatively sophisticated in an understated way: the face fades into the background the way the subjects of the piece have faded, the closer you get the more indistinct it becomes. I wanted it to look like an actual memorial -- which it also is, only to those we’ll never know. The response has been good so far. Some people have added items to it in the weeks since it opened, which is something I hoped for. It seems to tap into a deep need for mourning that’s very present in the society and has been for a while. For those of you in Brooklyn, 440 Gallery (www.440gallery.com) is located at 440 6th Avenue in Park Slope. It’s open Thursdays - Sundays (Thursday and Friday, 4 - 7pm; Saturday and Sunday 11am - 7pm). Over the last several years, Dave Bown Projects (DBP) has become prominent for its support of visual artists through an ongoing program of art purchases and for unrestricted monetary awards as much as $5000 through its series of semiannual competitions. The company has purchased prints from two of my series for its permanent collection in the past years. Earlier this year, DBP started a new initiative of presenting special editions of work from select artists and in July released a limited edition of 5 prints of a photo from my Littoral series (Littoral 105). This is a series taken along shorelines, capturing the momentary patterns left in the sand as the tides wash over it; it's very much bound up with questions of mortality and contemplation and the passage of time. There’s a sense of melancholy that comes now with visiting the woods. A conflict between experiencing the grandeur and wonder of the trees and plants and animals—the mind and body’s intuition of the life around you, unfolding without regard to you—and the awareness of how much these places and these lives within them are changing and may ultimately be lost from the climate catastrophe that’s upon us. You encounter their presence and their ghosts from the future at the same time. Everything has an aspect of being haunted about it. No visit to the woods is neutral or simply personal, purely about one’s own pleasure, any longer. The pleasure remains still, but it’s a pleasure alloyed. It’s something like holding a breath, knowing you have to let it go at some point. This awareness of loss and sense of melancholy are at the heart of my series, Last Woods, which are photos taken during extended, often solitary, walks through the woods and forested areas of the Northeastern U.S. I’ve been working on them on and off since 2009 and they’ve been seen in group shows in galleries around New York. I see them as portraits of the incremental, intimate process of decay taking place in a specific spot—the most basic process of life, of leaves returning to soil—while echoing the larger loss and decay of the woods as a whole. Altogether, the series serves as a form of witness and documentation, capturing a bit of life at ground level before these areas, their diversity and complexity are altered or diminished or, even, disappear.